Souvenir I, 1997, by Kerry James Marshall. Acrylic and glitter on canvas banner. Met-Breuer, New York. Untitled, 2009, by Kerry James Marshall. Acrylic on PVC panel. Met-Breuer, New York. 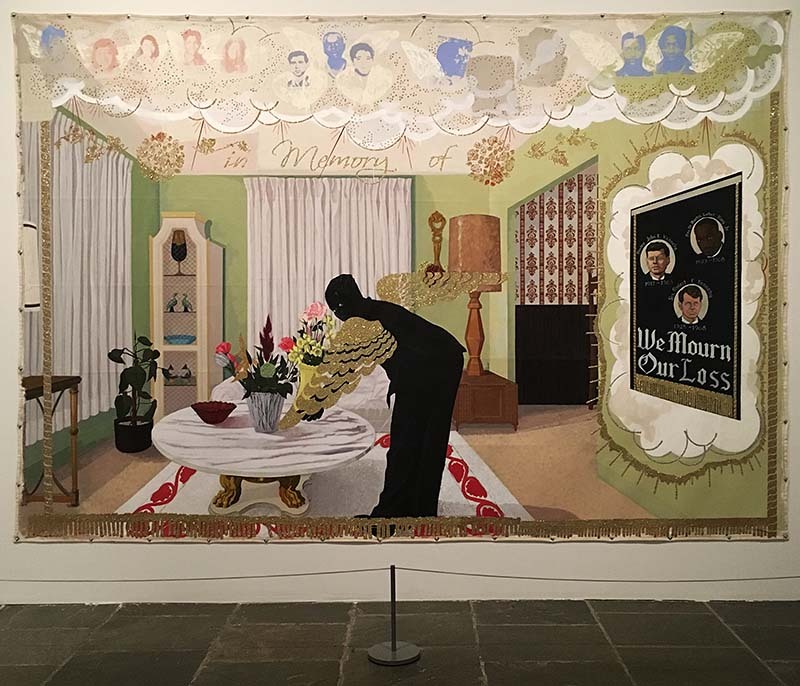 Mastry, a major survey of the work of Kerry James Marshall at the Met-Breuer in New York, includes 80 pieces that span the artist’s 35-year career. Marshall’s richly detailed, large-scale narrative paintings feature black figures in historical tableaus, landscapes, genre painting and portraiture. His work counters stereotypical representations of black people in society and comments on the history of black identity both in the United States and in Western art. The exhibition is powerful and especially relevant in our times of deepening racial divisions. 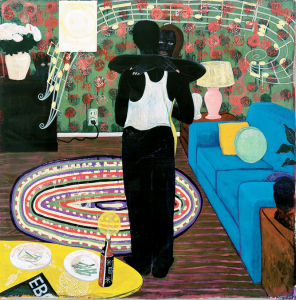 Slow Dance, 1992-3, by Kerry James Marshall. Acrylic and collage on canvas. Met-Breuer, New York. Marshall was born in 1955 in Birmingham, Alabama before the passage of the Civil Rights Act, and he was a witness to the Watts rebellion in 1965. In his PBS Art21 special, Marshall said, “You can’t be born in Birmingham, Alabama, in 1955 and grow up in South Central [Los Angeles] near the Black Panthers headquarters, and not feel like you’ve got some kind of social responsibility. You can’t move to Watts in 1963 and not speak about it. 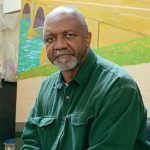 That determined a lot of where my work was going to go…” Marshall is a 1978 graduate of the Otis College of Art and Design and currently lives and works in Chicago. 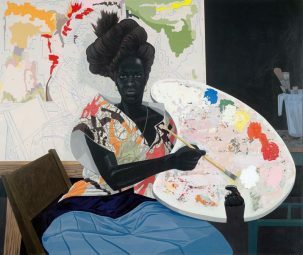 For in-depth articles on the artist’s influences and motivation, read Holland Carter’s article for the New York Times entitled Kerry James Marshall’s Paintings Show What It Means to be Black in America and Wyatt Mason’s feature for the New York Times Magazine, Kerry James Marshall is Shifting the Color of Art History. Kerry James Marshall. Photo: Oliver Chanarin & Adam Broomberg, New York Times Magazine. 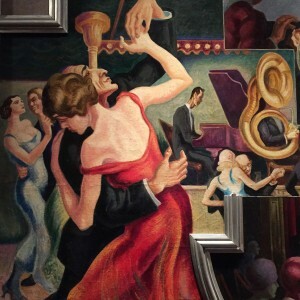 For a look at all of Marshall’s pieces in the exhibition, here are the Met’s exhibition thumbnails. 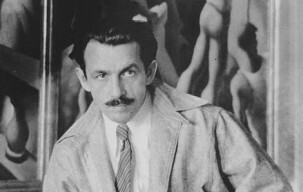 The exhibition also includes 40 works from the Met’s collection curated by Mashall that display the global and historical influences on his art. Kerry James Marshall: MASTRY is on view at The Met Breuer, New York City, October 25, 2016–January 29, 2017, and then travels to the Museum of Contemporary Art, Los Angeles, March 12–July 2, 2017. “The Plains Indians: Artists of Earth and Sky” at the Metropolitan Museum of Art features 130 objects on loan from more than 50 international collections, ranging in age from pre-contact to contemporary pieces. It has been called “one of the most completely beautiful sights in New York right now” in Holland Cotter’s review in the New York Times. The early Plains people had no written language, and they recorded histories and cultural and spiritual meanings through utilitarian and ceremonial art. They combined materials from the natural world to evoke the spiritual powers of animals, and later, incorporated goods acquired through trade with Europeans. In his audio introduction to the exhibition, Curator Gaylord Torrence explains that while there was no word for “art” and no special class of “artists” in Plains Indian culture, the creators of these works were extraordinary individuals who were known and honored among their tribes and sometimes beyond. The geographical area of the Plains cultures extended from Texas to Canada and from the Mississippi River to the foothills of the Rocky Mountains. Nations represented include Osage, Quapaw, Omaha, Crow, Cheyenne, Arapaho, Lakota, Blackfeet, Pawnee, Kiowa, Comanche, Mesquakie and Kansa. 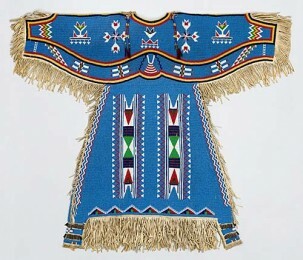 The masterworks in the exhibition include an array of forms and media: painting and drawing; sculptural works in stone, wood, antler and shell; porcupine quill and glass bead embroidery; feather work; painted robes, richly ornamented clothing and ceremonial objects. Many of the works were collected centuries ago by French traders on their travels through America and ended up in French, not American, museums–particularly the Quai Branly Museum in Paris, where the exhibition originated in 4/14. 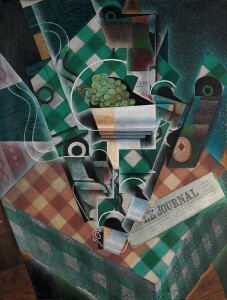 It then traveled to the Nelson-Atkins in Kansas City and was shown there from 9/14 – 1/15 before coming to the Met. 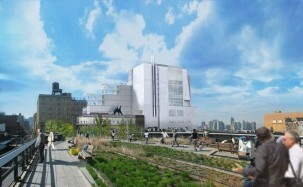 For more background on the exhibition and its major pieces, listen to the Met’s accompanying audio guide by curators Gaylord Torrence and Judith Ostrowitz, artists Edgar Heap of Birds and Dana Claxton, along with narration by Cheryl Crazy Bull, president of the American Indian College Fund. 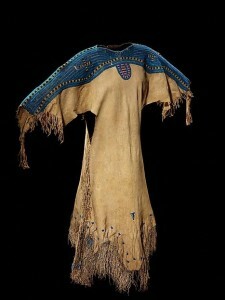 All of the exhibition objects are illustrated and described on the Metropolitan Museum’s exhibition website. Click on any of the images in this post for a direct link to the Met’s description. 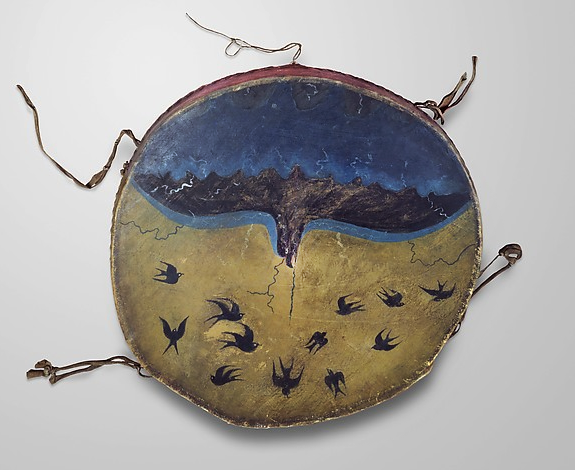 The Plains Indians: Artists of Earth and Sky continues through May 10, 2015. The Met is open 7 days a week: Sun-Thurs, 10-5:30, Fri-Sat: 10-9 & closed on major holidays. 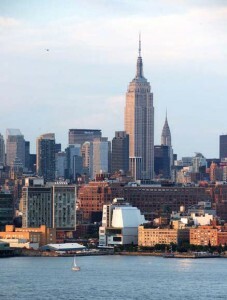 1000 Fifth Avenue (at 82nd Street) New York, NY 10028 Phone: 212-535-7710. 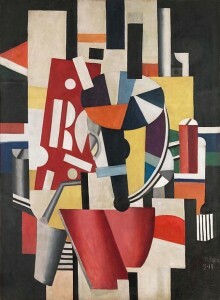 Cubism: The Leonard A Lauder Collection now on view at the Metropolitan Museum in New York is considered one of the most important assemblages of Cubist art in the world. The collection consists of 81 paintings, drawings, collages, works on paper and a few sculptures by Cubism’s four giants: Georges Braque (1882-1963), Juan Gris (1887-1927), Fernand Léger (1881-1965) and Pablo Picasso (1881-1973). 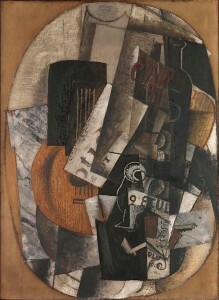 Most of the work dates from 1907 to 1918, and the Met has posted images of each of the pieces here. The trove of signature works is valued at more than $1 billion. 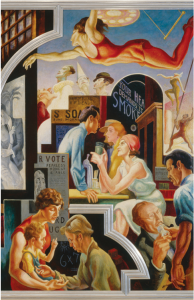 New York Times art writer, Roberta Smith states in her comprehensive review that “the work outlines the genesis of the modernist movement that set the stage for almost all others.” Accompanying her article is a 13-image slide show of the work in place. 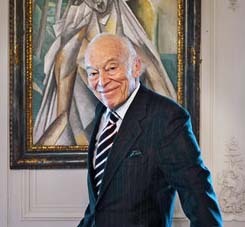 Lauder bought his first piece of Cubist art in 1976: a Léger. In her review of the exhibition, New York Times art writer Carol Vogel reports: Mr. Lauder said that “nobody wanted” Cubist art for the first 20 years he collected it, so it was still affordable. And early on, he knew that one day he would donate the collection to a museum. He said, “Before buying something, the question I always ask myself is this: If it were going to a museum, would it make the cut? If the answer is yes, then that’s what I buy.” The collection he put together now rivals that of major museums worldwide.